For the better part of the 20th century, the curve ball was a hotly debated topic among fans and players. Many dismissed the ball's sideward movement as an illusion. But Dizzy Dean, the legendary St. Louis Cardinal pitching ace during the 1930s, knew better. "Ball can't curve?" countered Dean, leader of the Cards' famed Gashouse Gang. "Shucks, get behind a tree and I'll hit you with an optical illusion." After he retired, former NIST Director Lyman Briggs used a wind tunnel he designed in 1918 and the pitching staff of the Washington Senators to settle a long-disputed question: the degree to which a baseball can be made to curve in the 18 meter (60 foot) throw from the pitcher's box to the plate. In 1959, renowned scientist Lyman Briggs, who served as the third director of today's National Institute of Standards and Technology, vindicated Dean and other masters of the mound. He did it with the aid of several Washington Senator pitchers and a wind tunnel he built in 1918 for pioneering research on aviation aerodynamics. Four decades later, the then-retired Briggs demonstrated that a thrown ball can curve up to 17 1/2 inches over the 60 feet 6 inches that separate pitcher and batter. The unraveling of the mystery of the curve—the ball's spin, rather than speed, causes it to break—captured national interest and was reported in papers from coast to coast. For posterity, Briggs published the results of his work in the American Journal of Physics. Nowadays, we take the curveball for granted, but in the early 20th century, many baseball players thought the curve’s sideways movement was an optical illusion. 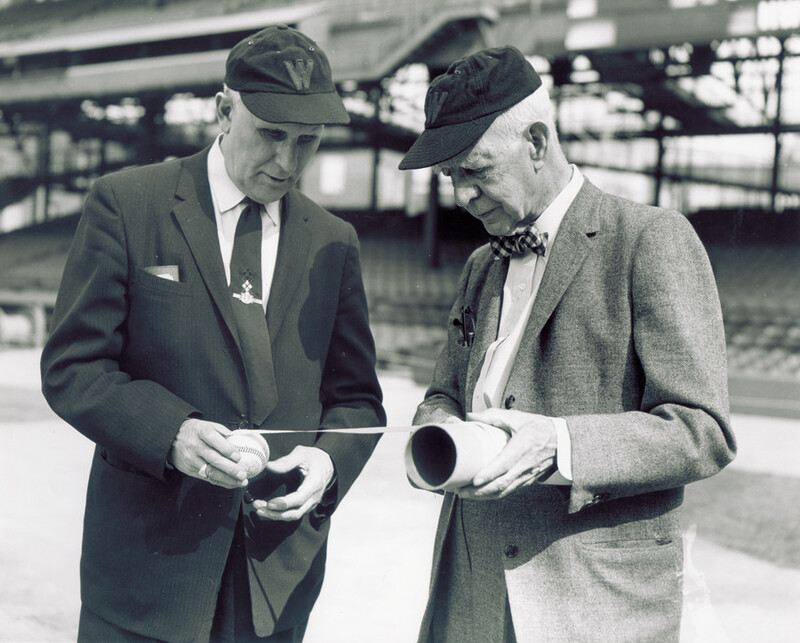 In the 1950s, director emeritus and baseball fanatic Lyman Briggs stepped up to the plate to settle the curveball question once and for all. On one occasion during his official tenure as director of what was then called the National Bureau of Standards (from 1933 to 1945), Briggs did turn his attention to a matter of general concern to professional baseball and of particular concern to batters. The issue stemmed from a wartime shortage of rubber. To stretch supplies of rubber, the American and National Leagues substituted balata cork centers for the rubber-cushioned cork centers that had been used in baseballs before World War II. The impact on the ball's resiliency was not known. The switch to an all-cork center was a boon for pitchers, as reported by Briggs in the January 1945 issue of the Journal of Research. "A hard-hit fly ball with a 1943 center," he reported, "might be expected to fall about 30 feet shorter than the prewar ball hit under the same conditions." For Briggs, who was an outfielder on the Michigan State College baseball team during the 1890s, the work was a brief diversion from the more serious matters of wartime research. In fact, Briggs directed much of the early work that led to the first atomic bomb. But tinkering with one of the essentials of the great American game also concerned the War Department, which joined a committee of the American and National Leagues in requesting the study. A congressional committee, however, viewed the matter differently. It called on Briggs to account for the work. The NIST director's explanation satisfied the committee. Briggs retired shortly thereafter, allowing him to pursue, years later, his curiosity about the physics of baseball. This excerpt from "Measures for Progress" provides a historical account of this episode. Dr. Briggs was given a bad moment or two over an incident during the rubber crisis. Early in 1945, the very active Senate Special Committee Investigating the National Defense Program (the Truman Committee) called on him to explain how a study he made in the bouncing characteristics of golf balls and baseballs could possibly contribute to the war effort. The Committee pointed to a paper he had just published, wonderfully entitled: "Methods for measuring the coefficient of restitution and the spin of a ball." Dr. Briggs explained and the committee subsided. Prodded to conserve rubber, even in miniscule amounts, the Services of Supply had asked the bureau about a substitute material being used in the baseballs it was supplying recreation centers at training camps. Extending an investigation he had made of golf balls in an idle hour before the war, Dr. Briggs took on the SOS request himself. The work, he reported to the committee, had been done by a high school boy He had merely made the analyses, with assistance from Dr. Dryden and Dr. Buckingham on the theoretical considerations. In baseballs with balata cork centers (made official in the major leagues in 1943), the coefficient of restitution or liveliness of the ball, Dr. Briggs found, was measurably reduced over that of the prewar rubber-cushioned cork center (official in 1938). The coefficient was still lower in baseballs with reclaimed rubber centers. "A hard-hit fly ball with a 1943 center," Dr. Briggs reported, "might be expected to fall about 30 feet shorter than the prewar ball hit under the same conditions." It was an important finding, contributing to the peace of mind not only of the professionals but of the sluggers in the (military) training camps. Allegations of bat tampering flew throughout the 1987 baseball season. Yet, not since 1974—when the bat of the New York Yankees' Graig Nettles broke and several compressed rubber balls spill out—had a hitter been ejected for using a doctored bat. In response to the latest flurry of bat-related rhubarbs, Major League Baseball Commissioner Peter Ueberroth granted managers permission to confiscate one bat from an opponent if they suspected tampering. In August, a representative from Ueberroth's office asked NIST experts on non-destructive evaluation to do a quick study of ways to detect illegal cork or rubber cores bored into the heads of bats. A handful of scientists and engineers from NIST's Gaithersburg, Md., headquarters, and Boulder, Colo., facility contributed to the effort. With four bats (two normal bats and two with cork cores about two pencil widths in diameter) supplied by Major League Baseball, the NIST team assessed a variety of approaches—ultrasound and several types of x-ray devices, including a CAT scanner. Two of the bats—one "loaded" and the other not—were even taken to Boulder Memorial Hospital for diagnostic x-rays, which were viewed from several carefully determined perspectives. The cost of the service was $30. Four bats supplied by the office of the Commissioner of Major League Baseball undergo a CAT scan at what is now University Hospital in Denver. In these cross-sectional CAT scans, the corked bore holes are easily seen in the two bats on the bottom. 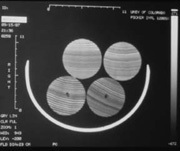 Taken along the length of the bat, this standard medical x-ray reveals the contrast in density between the pencil-like cork core and surrounding wood in the barrel. The radiograph was taken at Boulder Memorial Hospital. This set-up was used for taking ultrasonic measurements of corked and normal bats. Differences in grain patterns made it difficult to find unequivocal "signatures" in data gathered from doctored bats. Medical x-rays were probably the best imaging tools for non-destructive tests of baseball bats. They were deemed the quickest and most practical option, since most ball parks were equipped with x-ray machines for diagnosing player injuries. In contrast, measurements made with ultrasound were less definitive, and the data took longer to collect and interpret. On September 1, 1987, the day after NIST researcher Ray Schramm took two bats in for x-rays at Boulder Memorial, Houston Astros outfielder Billy Hatcher was ejected from a game against the Chicago Cubs for using a corked bat. No x-rays were needed in this case. Hatcher hit a broken-bat single, and one of the shards ended up in the hands of Cubs third baseman Keith Moreland, who held up the remnant for all to see. Said umpire John McSherry: "The bat was hollowed out at the barrel and had three or four inches cork inside it." Hatcher, the Astros leading hitter, said he was using a borrowed bat because all his bats were broken. He maintained that he did not know it was corked. He was suspended for 10 days, just as his team was challenging for a divisional title. Reflection: Why cork the bat? "At the time we had several discussions of the physics of corking bats. Was it a weight change that allowed a faster swing due to change in moment of inertia? Was it a change in coefficient of restitution that imparted more energy to the ball? I don't believe we ever came to a consensus. My opinion (and only that) is that any effect was strictly psychological." Tuning in the ol' ballgame. To track the fortunes of their favorite baseball teams, millions of Americans rely on their radios or TVs to follow the play-by-play action on the diamond. Thanks to NIST, these broadcasts are free of interference. Stations tune their transmissions to the precise frequency signals broadcast by NIST stations in Colorado and Hawaii. To prevent interference among stations that veered off assigned frequencies, NIST established a standard frequency and began broadcasting precise frequency signals in 1923. These frequency services continue to serve radio and television stations, power and telephone companies, and others. The Ball Park. Since 1991, 15 new Major League baseball stadiums have opened their gates. From steel girders to concrete ramps to heating and ventilation equipment, many of the materials, components, and systems that go into modern ball parks are built and assembled with the aid of measurement standards and quality assurance methods developed by NIST. For example, NIST began distributing standard reference samples of iron and steel in 1906, and it developed the first standard specification for Portland cement in 1912. Philadelphia's Shibe Park, the first concrete-and-steel stadium in the Majors, opened in 1909. Learn about building and fire research under way today at NIST. Goodness they're delicious, but how nutritious? At the request of the U.S. Department of Agriculture, NIST chemists have developed a Meat Homogenate Standard Reference Material (SRM 1546).This reference material helps meat processors and food and nutrition laboratories verify the accuracy of the nutritional values they assign to hot dogs and other process or canned meats. Check out NIST's other food-related Standard Reference Materials. Wow! Check out the new scoreboard display. The newest generation of "instant replay" boards will likely include full-color LED (light-emitting diode) displays based on a new materials technology refined and advanced by a small Durham, North Carolina, manufacturer. Back in 1991, Cree received almost $2 million in co-funding from NIST's Advanced Technology Program for a two-year project to develop a better way to process silicon carbide into large, high-quality single crystals. Cree's technical success has led to a variety of products, from 16-million-color, full-motion video displays to power semiconductors to lasers.